If the teacher arrives in the classroom in a foul mood, odds are she won’t inspire her students. If a coach is inflexible and teaches the same old material in the same manner he has taught for years, chances are he won’t be very valuable to his students. If a trainer doesn’t walk his talk, soon enough, he’ll be walking alone. 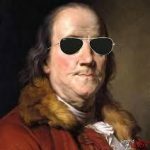 When we think about Benjamin Franklin, most of us remember the kite, the lightning bolt, and the discovery of electricity. However, Franklin was one of the first writers to address Self-Making. When Franklin introduced Poor Richard’s Almanac in 1732, he used blank spaces between the crop data and the weather information to insert clever bits of moral and practical advice to help people live a better quality life by the process of Self-Making… the art of making one’s own life rich and fulfilling. I’m sure you’ve heard the saying, “Fish and company start to stink after three days.” This was one of the hundreds of comments Franklin made about the subject of life. Another was, “Diligence is the mother of good luck.” Often we hear about a new musical group or movie star that became an “overnight success.” We figure that they must have been in the right place, at the right time, and knew the right people. But history tells us that most of the time their “overnight success” required many years of hard work and overcoming adversity and setbacks. Diligence if the mother of good luck. Self-Making is the art of taking personal responsibility to achieve success and pleasure in life. Haven’t you noticed that throughout society in general, that a good number of well-intentioned people lack the skills required for Self-Making? They believe they are successful and happy, yet in truth, they have only mastered the skill of self-deception; deceiving themselves and masking their own discontent Indeed, far too many people have not mastered the art of Self-Making – the art of designing happy and successful lives for themselves so they can share the principles with others. In addition to Benjamin Franklin’s discoveries and witticism, he provided three principles of success that have withstood the test of time. 1) Franklin’s first principle: Happiness doesn’t come from big pieces of great success; rather from small, daily achievements. Franklin suggests that we must be happy with what we have in pursuit of what we want. Too often we say, “Oh, I’ll be happy when I get more customers, more money, a new job, or a better relationship.” But you see that is a deception. We don’t become happy when something happens. We attract what happens because we are happy. When we focus on small daily achievements, such as waking to another magical day, enjoying a meal in a world where so many are starving, and perhaps most importantly, finding happiness in the midst of chaos and uncertainty, we discover that happiness isn’t reserved for a fortunate few. Benjamin Franklin believed in setting big goals and seeking big successes. But he also believed that happiness comes from the pursuit – in the right here; right now. It means that big achievements come one step at a time and that we must enjoy and celebrate the little accomplishments in pursuit of our grander goals. 2) Franklin’s second principle is that life is not rigid. Each of us has the power to mold ourselves and our environments. We have the ability to think, rethink, change, and adapt to impermanence which is life’s only guarantee. Franklin says that it’s up to each of us to begin the molding and become and achieve all that we aspire to and that this requires flexibility and a non-rigid approach to life. We must dream, plan, anticipate, act, measure results, and be flexible in our approach. By using our minds and our abilities – and committing to focused discipline, we find that being flexible is transformative both in process and outcome. Holding on to limiting beliefs and habits is itself limiting. However, when we let go of the rigid and dogmatic demands that we place upon ourselves and others – and on life – we then have the ability to focus our attention on the little steps that will ultimately lead us to that something big. 3) Principle three, according to Benjamin Franklin, is that success is a pleasure. Franklin contends that if what we are doing today is not satisfying or gratifying, we can’t possibly view ourselves as successful. In fact, quite the contrary. If what we are doing today is not satisfying and is not pleasurable, we are laying the foundation for a non-satisfying future as well. Even in the midst of chaos, conflict, and adversity, if we are unable to focus our attention on all that we have and all that we have to be grateful for, inclusive of the “tough stuff,” we cannot possibly be successful. In fact, Franklin says that regardless of how many worldly possessions we own, how much money we have, and the loving people we have in our lives, if we are unable to find pleasure in all that we experience, we cannot consider ourselves successful. And if we require evidence to support this principle, we need only look to the many people in Hollywood, sports, or business who seem to have it all – yet don’t find authentic pleasure in their successes. I know that success is a relative term and it means different things to different people. To a school kid, success may mean three stars on her latest test. To a homemaker, it may mean having a well-run household and maintaining an organized schedule. To a businessperson, it may be the thrill of closing a major contract, having a backlog of clients in the pipeline, or the pride of receiving a raise or bonus. But the one testimonial you will almost always hear from successful people is that they are happy because they envisioned something big and committed to it. But the happiness came from the many small daily successestheyhadwhileclimbingthemountainofsuccess. Andwhenthingsgottoughanddidn’tgotheir way as they headed toward the summit, they found pleasure in their own resourcefulness to best deal with it all. Dorothy is a good example of Benjamin Franklin’s concept of Self-Making. She found herself in a new and very frightening environment. She was scared and only wanted to go home; that was her big dream. Yet, she taught us that happiness doesn’t come from achieving the grand dream. Dorothy found happiness in the small, daily achievements in pursuit of the larger goal. In fact, after all her fears and challenges, she had a difficult time leaving her friends when it was time to go home. She knew life was not rigid; that she had to adapt without complaining, finding excuses, or blaming others. Dorothy adapted when she headed down the Yellow Brick Road alone; not knowing what was in store for her. She adapted when she discovered that the great OZ wasn’t so great. She adapted when she was captured by the Wicked Witch. But Dorothy also taught us that success (the process of getting home) is a pleasure. Even though her dream of returning home had yet to be realized, she found pleasure in the small things along the way – even the challenges, the fears, and disappointments. Dorothy was a success because she made the most of every moment and every experience. She faced what she had to face – with pleasure. That’s success. Let’s Take Note of Mr. Franklin’s Three Principles of Success. 1. Big achievements come one step at a time. 2. We have the power to mold our lives if we consciously pursue greater knowledge and improve our skills every day and are flexible along the way. We can shape and reshape every aspect of our lives at any time we want because human beings are the only species with the ability to do so. 3. Success is measured through pleasure. Actually, this is the key principle. We’ve got to be happy along the way, inclusive of all that we face – the good, the bad, and the ugly. This means patting ourselves on the back when we achieve the little goals and being kinder to ourselves when we slip and fall along the way. When we dedicate ourselves to Self-Making, and enjoy the process of molding our lives regardless of setbacks, adversities, and so-called failures, we will arrive every day in this place called happiness. Then, AND ONLY THEN, will we be better “qualified” to inspire and empower others to live a richer, more rewarding life.